No matter how many news outlets Trump bans from the White House or how many other distractions he throws up, we can't afford to stop paying attention to the 2018 midterm elections. Fortunately, a lot of us are chomping at the bit to take back control of the House in 2018 by winning back the 52 (of the 435) seats that are competitive. The two main organizations I know of who are leading the charge on this are Flippable (who just reported their first victory - a Delaware state Senate race where the Democrat won by a narrow margin thanks to a burst of support from people like you!!!) and SwingLeft. 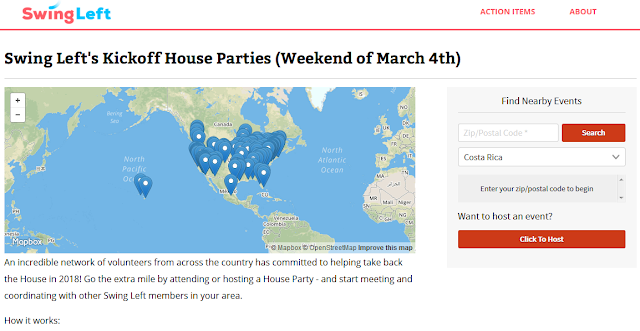 SwingLeft is kicking things off by organizing house parties across the country this coming weekend so people can meet each other and start to get organized. Today's action is to find a SwingLeft House party this coming weekend, RSVP and put it on your calendar. And if there isn't one in your area, maybe YOU should host one.